A pioneering system for the measurement and analysis of social impact through social networks (via Twitter). Display multiple data and compare results in visual graphic charts or simply display a timeline from a user or hashtag. Monitorize in real time the activity from multiple users or hashtags: new tweets, followers, retweets, mentions… Compare data in a certain period of time. View the last most relevants tweets. Social Audience Plugin es un script avanzado para la mediciÃ³n de audiencia social a travÃ©s de Twitter. Un sistema pionero y fÃ¡cil de usar capaz de ofrecer visualizaciÃ³n y anÃ¡lisis de datos efectiva del impacto social de usuarios y hashtags usando la API de Twitter. Medir, analizar y visualizar este impacto es su objetivo. Social Audience Plugin is a multi-functional Twitter feed system. A pioneering system for the measurement and analysis of social impact through social networks (via Twitter). Measure, analyze and visualize this impact. SA Plugin provide social media engagement, publishing and analytic tools for Wordpress users. A powerful plugin for social measurement. Monitor Hashtags and Topics on Twitter and analyzes incoming messages for all of your connected Twitter profiles to give you hassle free insights. Configure your trending topics, hashtags and influencers across your profiles. See the Tweets behind what’s trending, dig into day-by-day stats and chart relationships between hashtags & topics. You don’t need any HTML/CSS/PHP knowledge to install and use this plugin. Just upload and activate the plugin, that’s all. 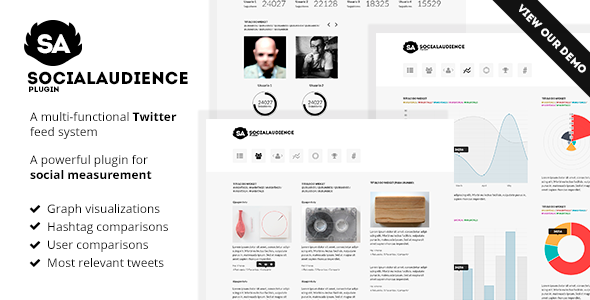 Elegant and efficient to link to your social profiles. Add more options to dedicated tinymce shortcode generator. Now you can reuse your created views that uses charts, only passing the parameter `type` to change the default graphic chart. Also added the possibility of showing the title.